The 1u steel cable management can be used for all patch panels,rack and cabinet mount products. 1. 1U high and compact, suitable for 19 inch standard cabinets and wall mount. 2. Material: carbon steel . 4. Light weight ,easy to install or unstall. 5. Provide termination, protection, connection, management of the cable. 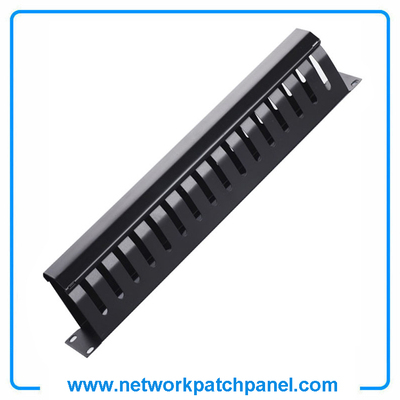 Patch Panel, Face Plate, Patch Cord, Cable Management, Cat5e/Cat6 Cables, RJ45 Keystone Jack, etc. 7. Custom-made cable management is acceptance. 8. 12/24/48/50/100/200pairs cable configuration are available. 1.Mounted on 19" network cabinet and open rack to accomplish the cable containing and management functions. 2.Able to be mounted in the front of the rack to provide cable arrangement,fixing,routing and protection of distribution frame or equipment patch cord,convenient for the patch cord operation and management of simplified,increase and change.